What if the substances we’re interested in are colourless? There aren’t any spots to see! There are two simple ways of getting around this problem. If the stationary phase ( the solvent part) has a substance added to it which fluoresces or glows when exposed to UV light, the glow is masked at the position where the spots are on the final chromatogram – even if those spots are invisible to the eye. That means that if you shine UV light on the paper, it will all glow apart from where the spots are. The spots show up as darker patches, like this. While the UV is still shining on the plate, you obviously have to mark the positions of the spots by drawing a pencil circle around them. As soon as you switch off the UV source, the spots will disappear again. In some cases, it’s possible to make the spots visible by reacting them with something which makes a coloured product. A good example of this is in chromatograms produced from amino acid mixtures. Amino acids are the building blocks of proteins. The chromatogram is allowed to dry and is then sprayed with a solution of ninhydrin. 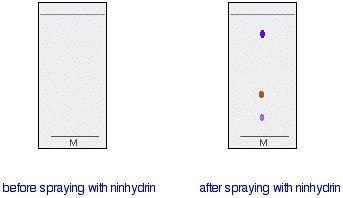 Ninhydrin reacts with amino acids to give coloured compounds, mainly brown or purple. Have a look. In another method, the chromatogram is again allowed to dry and then placed in an enclosed container (such as another beaker covered with a watch glass) along with a few iodine crystals. The iodine vapour in the container may either react with the spots on the chromatogram, or simply stick more to the spots than to the rest of the plate. Either way, the substances we’re interested in may show up as brownish spots. A little bit of revision first of all. A mixture contains two or more substances which have not reacted chemically with each other. A mixture is made of little bits of each substance mixed together. A mixture can be separated by physical methods, a compound can not. A mixture of iron filings and sulphur can be separated by using a magnet to attract the iron. Iron is a magnetic material but sulphur is not. If a mixture of iron filings and sulphur is heated the iron reacts with the sulphur and the compound iron sulphide [FeS] is formed which is not a magnetic material and cannot be separated by using a magnet. 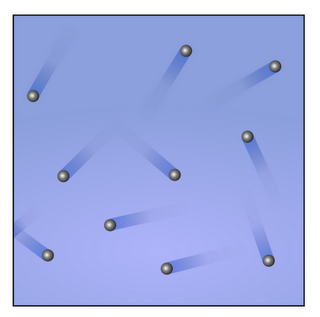 Separation Techniques – Physical Methods. We’ve already covered paper chromatography and Rf values. You should be able to work these out We calculate a number between 0 and 1 – the smaller distance travelled by the pigment divided by the larger distance travelled by the solvent. This is the Rf value for this pigment. The yellow pigment has a value of 14.5/18.5 = 0.78. Here’s a thought. Sometimes the ‘pigments’ are colourless. What can we do with these? Here’s the answer. This little applet shows what happens when you take the lid off a perfume bottle. There’s no way of stopping it, so just watch for a bit, then go back. In solids the particles are packed very closely together. They vibrate (as if connected by tiny springs) about fixed positions and have strong forces of attraction between them. In liquids the particles are close together but not as close as they are in solids. They can move around in any direction and are not fixed in position. The forces of attraction between them are still quite strong but, again, not as strong as in solids. In gases the particles are very far apart with large distances between them. They move around very quickly in all directions and the forces of attraction between them are very, very weak. You can change the state of a substance by heating or cooling it. When the change is from a liquid to a solid it is called freezing. When the change is from a gas to a liquid it is called condensing. When the change is from a solid to a liquid it is called melting. When the change is from a liquid to a gas it is called boiling or forced evaporation. This little game is quite fun to play. If you get to the end AND you can figure out how to get a printout of the ‘Well done…’ like the one below, hand it in to me….Merits available, of course. Just for information – here’s a new element you might not know much about. 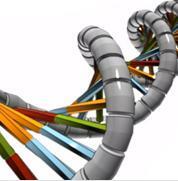 Check out this hot link about DNA which is getting a lot of great publicity. I’m wondering whether to put some Biology on the blog. I’ll be waiting for a few comments to see if people like it and would like me to develop this strand further. This is a simulation of a linear air track, which you might have seen briefly before in the IG course. The trollies or carts float on a cushion of air, so can move horizontally with a gentle push at more or less constant speed. If the carts have small magnets attached to them, they can either stick together and collide inelastically or repel each other without touching, simulating elastic interactions. You can vary the speeds along a straight line, also the masses of the carts, hence calculate momenta and kinetic energies. For a momentum calculator, click on this link. There’s lots that Wolfram Alpha can help you with. It’s worth having a look around, especially at the Maths parts.